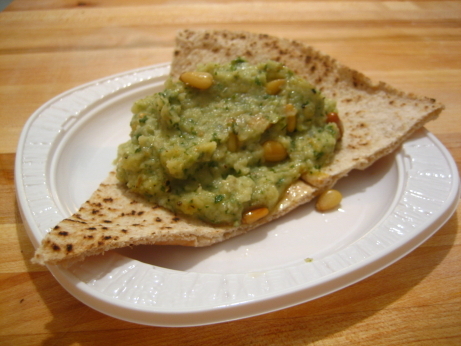 Hummus is a staple of my diet, and although I rarely make them, I quite like lima beans, so, I figured this lima bean hummus was a good bet. I’ve been doing some serious damage to the bean spreads in the book, and this was one of the last ones that really appealed to me. In the end it wasn’t the dip I was hoping for. It took some very nice ingredients, did some very silly things with them, and resulted in a muddy confused mess. You start this dip by simmering frozen limas, onion, and garlic in water, then stirring in cilantro and parsley and letting the herbs steep. You then drain off the water and transfer the solids to the food processor. They then go for a spin with cumin, cayenne, lemon juice, olive oil, fresh dill, and fresh mint. The dip is then allowed to cool, seasoned with salt, pepper, and lemon juice, drizzled with olive oil, and served. There were a lot of big flavours going into this dish, but the preparation did them a disservice. The onion and garlic are boiled along with the limas in this dish. Boiling doesn’t do much for aromatics unless you’re making a soup. I’d much prefer to sweat them to take off some of the harsh edges, in exchange for a little caramelization. As it was most of the onion and garlic flavour, and that of the cilantro and parsley, ended up in the liquid the beans simmered in. Five minutes later that liquid went down the drain, and the exhausted remnants of the aromatics went into the food processor. The beans were still very hot at this point, fresh dill and mint were added. Both of those herbs are wonderful when they’re crisp and cool, and they lose something when heated. By the time the dip had come together and cooled to room temperature is was a bland mush. I tried to overcompensate with lemon juice and salt to bring things back to life, but once the flavours are gone they’re gone. I added toasted pine nuts in a last ditch effort to save this dip, and they did moderately improve things, but no one was really thrilled and I had to plow through three days of leftovers. Beyond the counterproductive cooking instructions, I think there was too much going on in this dip. Between onions, garlic, four different types of herbs, cumin, and cayenne, there were a lot of flavours competing for attention. Granted they were all washed out imitations of themselves, but it was still a busy dish. In fact there was so much other stuff in there, that the lima beans weren’t really a player. They were puréed, so their texture wasn’t an issue, and other than adding a little starchiness they weren’t a big flavour contributor. You probably won’t like this dish, but it won’t be because you don’t like lima beans. Altogether this dish was entirely forgettable. It wasn’t particularly bad, just another bland mush. It’s only truly frustrating when you’re the one making it. You put fresh fragrant ingredients in, and methodically set about discarding or destroying their goodness, you then serve what’s left. Hope you start cooking more! Been waiting for your latest recipe. Thanks for waiting Cindy. I’ve certainly be letting the pace slide a little bit, but I’m working to get back on track with my writing. cindy maybe you should go to epicurious.com that’s where this recipe came from.